(atb). Late in the fourth quarter, the Marburg Mercenaries – reigning EFAF Cup Champions – failed on their last attempt to get back into a game which they had in reach, yet never won. Kicker Patrick Wolff missed from 28 Yards out, finishing off a 28:31 defeat by the Graz Giants, as well as a weekend in which all Austrian teams beat their respective opponents from Germany. 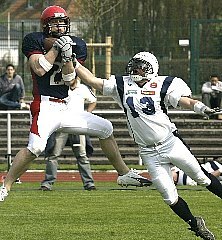 The game started with a touchdown Pass from Quarterback Jo Ullrich to Wide Receiver Marc Biedenkapp who broke the scoreless tie on a 35 Yard touchdown catch. Graz did not take long to come back. After a pass by Sheldon Cross, Jeremy Bohannon danced 50 Yards on his way into the endzone by making plenty of defenders miss. Even though the running game of Marburg never got going, Gerome Castleberry found a crest for one long run. The Texan broke free for 48 Yards, to make the score 14:7 in favor of the hosts. But lack of discipline and poor play resulted in two more scores for the Austrians before the half. Both times Runningback/Linebacker Darwin Lewis converted from three yards out to make it 14:21 before heading for the locker rooms. The second half saw a better game in which both teams were evenly matched. Kipperers Field Goal made it 14:24, before the Mercenaries started their best quarter of the game. Again Biedenkapp >from 15 Yards and Glock from 6 Yards out, capitalized on passes from Ullrich to give the home crowd something to cheer about. With the 28:24 in hand it looked like the game was finally turning towards the Mercenaries when Linebacker Mike Overly made an Interception. But the offense never got back on track. In the fourth quarter Bohannon put the icing on the cake for the Giants scoring >from 40 Yards to give his team the last word and victory.